Ada M. Hicks married Merritt Merchant Houghton, son of Jonathan Houghton and Mrs. Lydia Walker, in May 23, 1880 at Readsboro, VT, USA, age 47, 2nd mar, a merchant; Pringle: 1878. Mortimer Merritt Houghton married Ruth E. (?) in circa 1907 age 24 and 20; mar 3 y in 1910 census. Elizabeth Pearson Child married Stuart Houghton Pringle, son of Ralph Pringle and Luella Houghton, in Aug 20, 1932 at Greenwich, CT, USA. Roy Templeton Will D.D.S. married Mary Ann Houghton, daughter of Hiram Cole Houghton and Ella Louise Bacon, in Apr 16, 1903 at Red Oak, Mills Co., IA, USA. Charles Houghton Will married Mae Peterson in May 17, 1929 at Council Bluffs, Pottawattamie Co., IA, USA. Father* Roy Templeton Will D.D.S. Mae Peterson married Charles Houghton Will, son of Roy Templeton Will D.D.S. and Mary Ann Houghton, in May 17, 1929 at Council Bluffs, Pottawattamie Co., IA, USA. Charles Houghton Will Jr married Shirley (?) in 1955. Ruth Will married Minor William Anderson in Apr 4, 1930 at Red Oak, IA, USA. Minor William Anderson married Ruth Will, daughter of Roy Templeton Will D.D.S. and Mary Ann Houghton, in Apr 4, 1930 at Red Oak, IA, USA. Gordon Will married Ruth Seabloom in Dec 30, 1936 at Des Moines, IA, USA. Ruth Seabloom married Gordon Will, son of Roy Templeton Will D.D.S. and Mary Ann Houghton, in Dec 30, 1936 at Des Moines, IA, USA. Caroline (?) married Elisha Houghton, son of Jonathan Houghton and Elizabeth Peck. 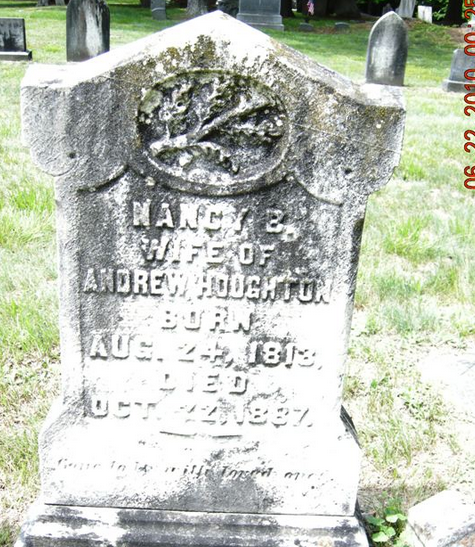 Almira Whitney married Joel Houghton, son of Jonathan Houghton and Elizabeth Peck. Elizabeth Stroud married Andrew Jackson Houghton, son of James Houghton and Chloe Carpenter, in Aug 16, 1849 at Stamford, Bennington Co., VT, USA. Nancy B. Montgomery married Andrew Becket Houghton, son of Jonathan Houghton and Elizabeth Peck, in Dec 30, 1830 at Rupert, Bennington Co., VT, USA. James Henry Houghton married Hetty C. Goodwin. James Henry Houghton married Phoebe A. (?) in circa 1882 mar 18 years in 1900 census. Edwin S. Houghton married Matilda Sherman in circa 1869 mar 31 years in 1900 census. Matilda Sherman married Edwin S. Houghton, son of Andrew Becket Houghton and Nancy B. Montgomery, in circa 1869 mar 31 years in 1900 census. Nancy Houghton married (?) McDermott. (?) McDermott married Nancy Houghton, daughter of Edwin S. Houghton and Matilda Sherman.